The inhabitants of Chez King have been struck down by the lurgy,Youngest Daughter has been off school,after passing it on to everyone else,but hey ho, Myself I have rallied as one must,but I have to be honest I am glad the week is nearly over,we are all on the mend thankfully and I felt the need to celebrate by way of making a cake. 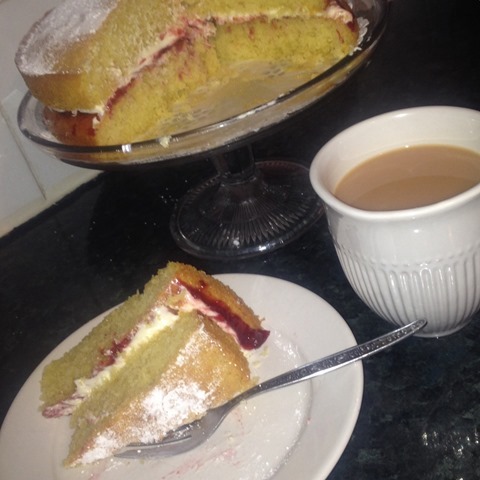 Ahh cake,the answer to everything,the cure of all ills,a cup of hot strong tea that you could stand a spoon up in and all is well in my world. I have long endeavoured to find the easiest and most foolproof recipe for the perfect Victoria sandwich,past attempts have seen them sunk in the middle,to thin,too thick,soggy bottom.Ahem. But friends eventually I had an epiphany! and here it is,the simple truth that has completely evaded silly me for so long. YES!!! as fellow bakers will know you use equal quantities of fat,sugar,flour and eggs,the eggs for me being the tricky part,just how many eggs are the equivalent of 250gms for example?DOH!, weigh them you numpty. So here is my foolproof recipe,I weigh the eggs first and then use the same amount of other ingredients. 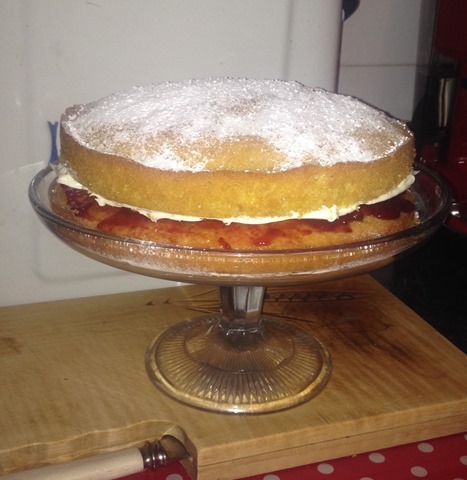 The best Victoria sandwich cake recipe. Cream butter and sugar until soft and creamy,add vanilla essence.In a seperate bowl mix eggs,add eggs,baking powder and flour a bit at a time,folding gently,lightly grease two medium cake tins and line with baking paper,then divide the mix into them.Bake in a moderate oven around 180 for roughly twenty minutes(keep checking obviously) when springy to the touch or you can stick a skewer in the middle and it comes out clean,they are ready.Leave to cool before turning gently out of tins.Sandwich together with your favourite jam and buttercream icing,then dust the top with a little sieved icing sugar.